Italmill’s history dates back to the 15th April 1901 when founder Cesare Besozzi, graduate in business and economics, built the first corn mill in Varese thereby establishing the limited partnership Besozzi Marzoli & Comp.i. Industrial activity started in earnest the 1st June 1911 when the current group leader, Molini Besozzi Marzoli S.u.r.l (“Atto Costitutivo“) was founded in Milan and one of the most advanced pieces of milling equipment in Italy at the time was installed and started operating. In addition to running the business, Besozzi devoted his time to fostering relationships between millers in both Lombardy and throughout Italy. In 1917 he founded the National Association of Millers in Rome, of which he became president. He was also president of the Milan Grain Association and in 1918 he founded and became president of the Lombard Consortium of Millers. 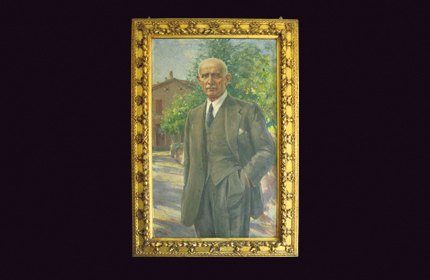 In 1926 he came up with the idea for and became president of the Milan Grain Stock Exchange. In 1950, before definitively handing the reins to his son-in-law, lawyer Giuseppe Ferrario, he carried out much needed building work on the Via Adige building enabling new milling equipment to be installed. Of his many projects, the spiral staircase, designed by his friend architect Piero Portaluppi, is worth remembering. In 1970 the mill’s management was passed onto the third generation with Dr. Enrico Ferrario at the helm. Following in his grandfather’s footsteps, in addition to being CEO of M.B.M. S.p.A. Dr. Enrico would also become president of the Milan Grain Association, president of the National Association of Millers in Rome, president of the European Association of Millers as well as president of the European Grain Stock Exchange. By his side helping him run the business was, among others, his brother Cesare. Dr. Enrico Ferrario had an eye for the long-term future of the business and successfully brought it into the new millennium. In 1992 he moved the business from Milan to Bergamo and combined flour milling, the manufacturing of semi-finished products and the sale (in Lombardy) of all the ingredients, semi-finished and finished products required for bread, cake and pizza making. The family’s business activities were grouped together and, in 2006, they moved to new premises in Cologne (BS). And so in 2013 Dr. Enrico Ferrario and his son Dr. Filippo Tancredi Ferrario brought the process of transforming the group to a close. They completely restructured the sociogram of the group: GruppoMOBE S.p.a. is now tasked with activities of production, administration and logistics while Italmill S.p.A. carries out commercial, research and development activities (associate Antonio Meneghini manages the distribution platform in Sondrio).